These spicy Thai drumsticks are so addictively delicious. The meat is very tender, moist and juicy. Best of all, it's very easy to make. After cooking the Thai fish cakes with spicy Thai eggplants, I still didn’t feel have enough of Thai foods. How glad was I when I found some organic drumsticks in the nearby supermarket as they don’t have them available all the time. I love baked sticky, yummy, delicious drumsticks. 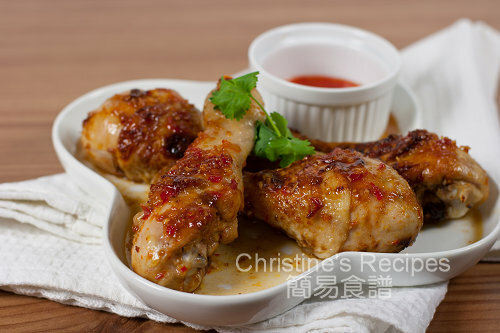 Why not bake some spicy Thai drumsticks to cure the craving for Thai foods? I’ve experimented many different ways to bake drumsticks and found that using the ceramic or Pyrex baking dish is the most effective and best way to keep those meaty drumstick moist, with most juice left on dish after baking. The metal baking trays can’t beat in this aspect. Rinse chicken drumsticks and wipe dry with kitchen papers. Combine with marinade very well. Cover and transfer to fridge for 1 hour. When you’re ready to cook, remove drumsticks from fridge and place in room temperature for a while. Put a ceramic baking dish in oven, and preheat oven to 200C (395F). Heat 2 tablespoons of oil in a fry pan. Remove lemon grass from drumsticks and leave them in marinade. Reserve marinade. Cook drumsticks and brown all sides over medium heat. (Note: you don’t need to cook through the chicken at this stage.) Transfer chicken to the hot baking dish. Pour the reserved marinade onto the chicken. Pop them in the preheated oven. Reduce the temperature to 190C (375F). Bake for 35 to 40 minutes. Test with a needle inserted into the thickest part. If only clear liquid runs out, it’s cooked. Remove from oven. Let rest for 3 minutes. Garnish with coriander. Serve hot. Use organic drumsticks to ensure the best results. Or use free range drumsticks if you can’t get organic ones. It makes a big difference in taste if using organic ones. Use a needle to prick the surface of all sides of the drumsticks in order to help marinade penetrate into the drumsticks inside. 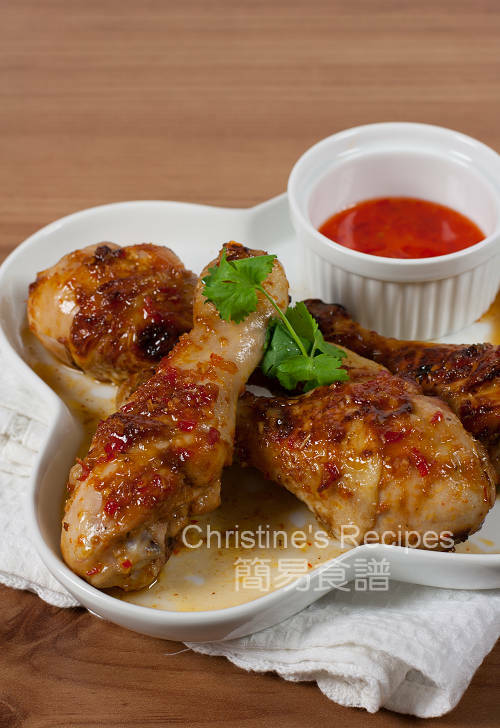 Ceramic baking dish is the best utensil for baking moist and juicy drumsticks. If using metal ones, try to use the thick and hardy ones to get a better result. Yes, your drumsticks look moist and perfectly done. Ceramic dishes are also my friends for baking and grilling. Hope I could find organic drumsticks here :( :). Look at that marinade turn into flavor bomb after baking. That is awesome! I have gotta try too : ) finger licking!!! Next I will try using ceramic dish to bake the chicken wings too! Mmmm....delicious! I usually use pyrex dish if it's smaller portions but big metal tins if I have to make for many people. I want to try the recipe too! They look fingerlickingly yummy! wow they look so juicy! I love the sound and looks of these tasty finger foods. We order these all the time in the Thai restaurant but now, thanks to you, I can have them at home. can you use chicken thigh for this recipe? if so, do you have to change cooking time and temperature? i was also wondering if we could use something else rather than wine related things for the marinating part? You might just skip the wine if don't have. Just tried this and the chicken was so moist and delicious! I might skip the garlic next time, though. I'm not sure why, but it seemed a little overwhelming. Thank you fo the excellent recipe! Just made this I found it to be quite salty. Chicken was moist but I had to remove the skin due to the saltiness. This recipe yields only 2 teaspoons of fish sauce and a bit of salt to marinate 850 grams of drumsticks. Suppose that the quantity of all ingredients you measured was correct, it shouldn't be too salty. Hmmm, interesting ! Guess that it could be the fish sauce you used is different from mine. I know the saltiness of fish sauce varies from brand to brand. Ketchup is similar to tomato sauce but not exactly the same. You can easily find it in supermarkets. Just made this yesterday using chicken wings instead (the only available ones in my fridge) loving the taste combination! My girls were licking their fingers after finishing the chicken! They will ask for more next time. Thanks for letting me know. Hi Christine, may i know if I can use Lingham sweet chilli sauce to replace the thai chilli sauce? Thanks! Hi Christine, may I use Lingham chilli sauce instead of Thai chilli sauce? Thanks! It's no harm to experiment with your own favourite chilli sauce. Let me know how it goes if you've tried.